This is Trey Patterson signing back in for my 2nd week of ‘Diary of a Baller’. I hope everyone had a wonderful and blessed week. This week was a very busy week for me, that seemed like it would never end. I had two cross county meets this week, which is very rare, usually it’s just one meet a week, but for some reason, this year, the season started off in overload. In addition to my track schedule, I still had my basketball workouts for the week along with completing school work assignments. I had a science quiz, in which I believe I did very well on. As I stated in my last entry, On Tuesday, I had my first cross country meet against Gill St. Bernards and I am excited to report that I won the race and came in 1st place overall. My final time was 10:24 on the 1.7 mile course, this time was a personal best for me from the previous time I recorded at this course last year. 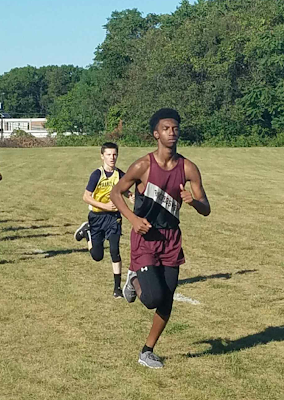 I really enjoy running cross country because not only does it help me build my stamina for basketball season, but I also see how running has strengthened my legs and is a way for me to stay healthy as well. On Thursday, I had my second cross country meet of the year, it was pretty hot out during the run, I got through it, but I felt I didn’t run as well as I wanted to, however, I finished 2nd for my school which isn’t bad at all. My final time I believe was around 11:35 on a 1.8 mile course. There is always room for improvement, so I will continue to work hard to keep on improving. After my track meet, I had a basketball workout that my dad brought me to, I had a small window of down time before the workout and I was so exhausted and remember thinking to myself, “how am I going to get through this”?? Well, I somehow caught a second wind, and did what it took to get better that night. As Friday approached, I was so looking forward to the weekend. We had a light cross country practice at school because of the meet yesterday, which I was happy about because I knew I had another basketball workout after school. The workout consisted of evaluating me for any weak muscles that can cause me to get injured in the future and how to strengthen those muscles. Also, I was tested on my reaction time and other things to help improve how quickly I process situations on the court. On Saturday, I attended one of my friends’ Bar Mitzvah. It was really cool to experience how other cultures celebrate important events. I really had a great time and met a lot of new people. To end my week, I had a AAU workout on Sunday and it was pretty intense for two hours. At the beginning of the week, I knew what was in store for me, and I didn’t know how I would get through it, but I Survived!! Trey Patterson signing off! Until next time folks! !